The Pretty Pastel Range from Knots and Kisses is a versatile and pretty design which is suitable for an array of wedding themes; floral (sporting gorgeous anemone flowers (which are very ‘in vogue’ at the moment, don’t’cha know? )), pastels, vintage, country garden, spring, summer… you name it, you can pick out a multitude of themes to run with in this design… even the headers and backgrounds are reminiscent of ice cream (vanilla, strawberry and blackberry)! Imagine that – an ice cream themed wedding! Amazing. 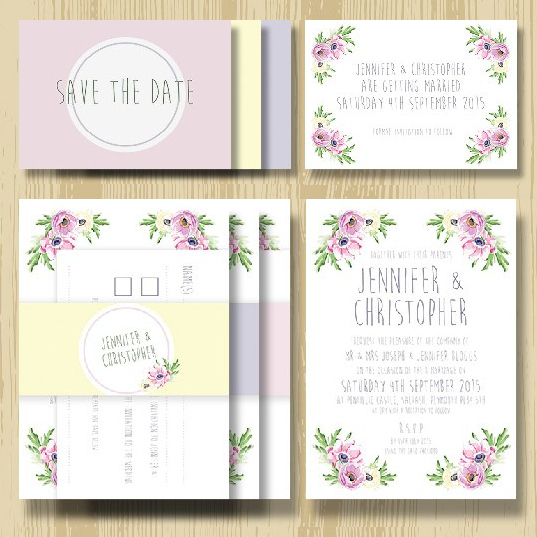 Perfectly spring-like, this design has such a wedding feel – we love it! We also love the pop of colour it adds, brilliant for those of you who have colourful and fun personalities and want to express this in your wedding stationary. The focal point of the range is a trio of beautifully illustrated anemones in lemon, lilac and pink (or if you’re of the ice cream persuasion, vanilla, strawberry and blackberry). A gorgeous, elegant font and lovely little touches such as the pretty envelope liners which provide a nice little surprise when your over-excited guests delve into their freshly delivered invitations… which might we add, could have an equally pretty pre-addressed label stuck to the front, if you so choose. Extra touches like this are what will make your guests say ‘Oh wow, they’ve thought of everything!’ – top marks to you! This extensive range is printed on 350gsm card, perfect quality to capture the vibrancy of the ink. You can choose to have the whole range in lemon, lilac or pink or you could mix it up and have every part of your wedding stationary a different colour, for example, your menus in lilac, your place cards in lemon and your order of service cards in pink. Chic, romantic and pretty – perfect!